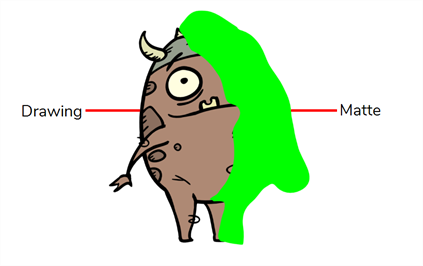 You can use the Cutter node to hide parts of a drawing, a group or an effect. The Cutter node must be connected to a drawing that will serve as a matte. Parts of the drawing, group or effect that intersect with the matte drawing will be hidden. Optionally, you can also invert the Cutter node's matte, which will make parts of the drawing, group or effect that intersect with the matte drawing visible, and everything else will be hidden. In the toolbar above the layer list in the Timeline view, click on the Add Layer button and select Effects > Cutter. Right-click on the layer and select Insert > Effects > Cutter. The Cutter effect is created as a child of the selected layer. In the toolbar above the layer list in Timeline view, click on Add Drawing Layer . In the Add Drawing Layer dialog, give your new drawing layer a relevant name for a matte layer, such as "Matte-Drawing", then click on Add and Close. In the new matte drawing layer, draw a matte for your effect. Your matte can be a simple shape, but should be filled with a colour, as only parts of the matte that are opaque will be taken in account. NOTEMattes can also have semi-transparent areas. Areas of the drawing that are covered by semi-transparent areas of the matte are partially affected by the effect. In the Timeline view, click on the Expand button right of the Cutter layer. The Cutter's Matte parameter appears below it. Drag and drop your matte layer next to your Cutter layer's Matte field, under the Parameters column. The matte drawing layer becomes the Cutter layer's matte. At this point, areas of the artwork that intersect with the artwork in the matte drawing layer are hidden. 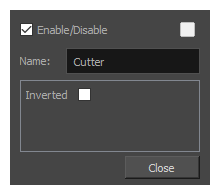 If you want to invert the Cutter's effect, so that the artwork that intersects with the artwork in the matte layer is visible and that everything else is hidden, double-click on the Cutter layer (but not on its name) to open its Layer Properties dialog, then check the Inverted parameter.